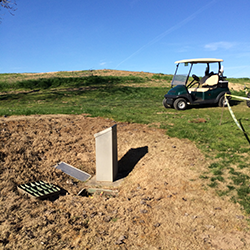 GIC is the only irrigation consulting and contracting company that can perform all of the work associated with a control system replacement or upgrade. GIC has installed new satellites in the middle of summer. 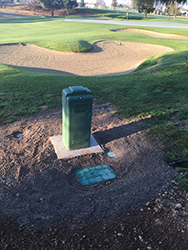 There is never more than 24 hours of downtime and when absolutely needed, we have created a process that entails installing new satellites on new cement pads and the client was able to irrigate on the same day. 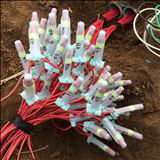 Once on site GIC takes the time to assist staff with troubleshooting irrigation wiring or other problems at no additional charge. In ten years we have never issued a change order and we have never had to return to a client for warranty work. During the Satellite Upgrade process, it is not as simple as taking off the existing box and slapping on a new one in it's place. 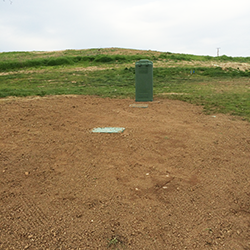 More often than not, we will re-position the Irrigation Satellite, pour a new concrete slab, and pull in new lead wires and splice them to the field wires. In this photo, we take great care in making sure that everything is wired up and properly labled. Golf Course Superintendents and their staff always like to see the 'Blooming Flower' before we place it in a junction box. Labeling everything makes it both easy to indentify which wire is what, along with making it easy to wire troubleshoot in the future.